Are you worn out getting everyone organised to go back to school? Stressed about what you’re going to put in the lunch boxes? Don’t be! 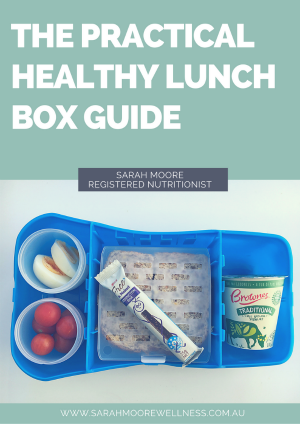 Sign up to get you FREE copy of The Practical Healthy Lunchbox Guide. Your one stop resource for putting together simple, healthy school lunches that will get eaten! How much and what types of food to put in plus a few bonus recipes. No fancy ingredients, no expensive sugar replacements, just practical food ideas for real families. You’ll get make it onto the list to receive my Free Monthly Newsletter. Stop getting bad nutrition advice from celebrities and unqualified experts out to make a buck. Sign up to my monthly SM Wellness newsletter instead. No spam, no sales. Just a monthly dose of wellness straight to your inbox. Don’t forget to follow me on facebook and instagram for for more school lunch themed tips, recipes and inspo.